What is a fish lure? 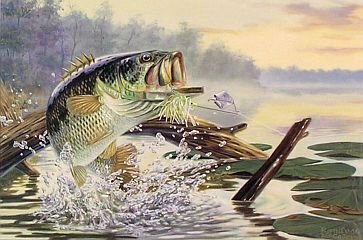 What are bass fishing lures? I don’t know the exact definition. But I do know lures, or choosing a lure, causes much raising of eye brows and wringing of hands for all bass fishermen. What size? What color? What is the weather report saying? Jeeze! What do those bass want?? Well here you go, maybe they want a crankbait. Crankbaits can be fished year round. They have a short or long lip on the front end that causes them to dive to certain depths. Or they have no lip at all and they float. If a crankbait has a short lip, it will run shallow, 1 to 3 feet. If it has a long lip, it will run 5 feet and deeper. The diving depth of the crankbait also depends on the speed of the retrieve, the length and angle of the rod and the size of the line. One key is to match the crankbait’s diving depth to the depth where the bass are feeding. You may have to experiment with different lures (wringing of hands here!) to find the depth where the bass are feeding. The lip of the crankbait also determines how much “wobble” it creates. Lips that angle down create a wider side-to-side motion. Most shallow running crankbaits have lips that angle down about 30 degrees. Deeper running crankbaits should have less “wobble”. If the deep diver has too much wobble, the wobble will cause too much friction in the water, and more strain on the body. Also it is harder to detect a hit if the deep diver has too much wobble and friction. Color choice is an important element of all bass fishing lures. Most of the time you want the crankbait to look like a shad or crawfish. 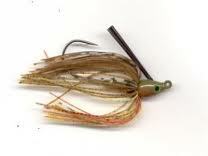 Maybe a silver/black and blue or a chartreuse/black and blue to imitate a shad. A red crankbait imitates a crawfish. The real key to crankbait fishing is hitting structure or cover while cranking. Bouncing off a rock bottom or deflecting off a stump or tree top are examples. This change of direction will cause the lure to roll and flash. This sudden flash will catch the attention of any bass in the area. Don’t try to hit bottom when fishing over vegetation. Just keep the lure slightly above the top of the grass. If the bass are there just chillin, maybe the lure will hit them in the head and wake’m up! That’s why I love crank bait fishing. I get to hit big bass in the head! I read somewhere that spinnerbaits are idiot proof. I was so relieved to know that! They are also versatile. 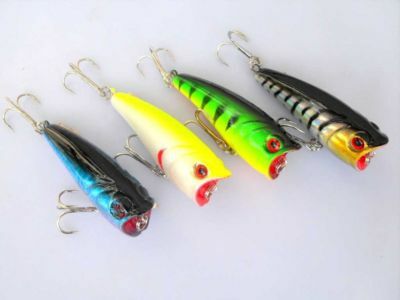 These bass fishing lures can be fished any season of the year and at any depth. However, spinnerbaits are most effective when fished in the spring in shallow water. They are pretty much weedless when fished in cover or structure. Do you know why spinnerbaits are so effective? The blades create intense vibrations in the water. All bass have a sensory system that detects the vibration and it drives them crazy. And of course the lure kind of resembles a bait fish. The bass is already hungry and the vibrations make him angry. So the bass attacks the spinnerbait because of angry hunger. Sounds like my ex-wife attacking a Big Mac! Choosing a head weight depends on water temperature, water clarity and how deep you want to fish. A 1/4 oz. spinnerbait works well in shallow stained water. A 3/4 oz. lure will get you down in the depths where the big bass hang out in hot weather. Arm lengths are referred to as “short-arm” and “long-arm”. The arm is the length of wire that holds the blades above the hook. Short-arm spinnerbaits are most effective when casting the lure and letting it drop vertically or “helicopter” straight down into deeper water along bluffs or deep structure. Long-arm spinnerbaits are more effective when cranking horizontally in shallow water or fast retrieving. The blades of a spinnerbait come in three different shapes. The Colorado blade is rounded and deep cupped. It is used best in muddy water and fishing around structure. The willowleaf blade is long and slender. It is easier to pull through vegetation. This blade works well in fast retrievals. The Indiana or Oklahoma blade has a teardrop shape. These blades can be silver or gold which creates flash. They can also be painted any color. Try combinations of blades and colors in different situations for best results with this bass fishing lure. As you might imagine, skirts come in many colors and sizes. Choose colors that imitate bait fish. If you are getting strikes but no hook ups, try trimming the skirt back even with the hook. Let’s not forget about the presentation and the retrieval. It is best to use an underhand cast to minimize splash. In shallow water, always try to cast past and crank through your target. The speed of the retrieval is always important. Use a “slow roll” to bounce the spinnerbait off the bottom. Do this in deep water or cold weather for lethargic bass. Use a “slow retrieve” to work around submerged structure and weed beds. Use a ‘stop and go” when you see bass following the lure but not striking. The “burn” is a fast retrieve in clear water. Cast as far as you can and crank the lure about a foot under the surface and see what happens. 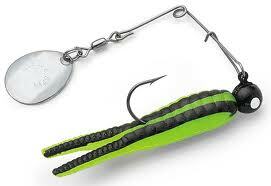 The beetle-spin is a versatile lure. It is a scaled down miniature version of a spinnernait. It will catch anything swimming. I always have two or three in my tackle box. The same could be said of the in-line spinner. This lure has been around a long time. It is simple in design and an effective bass fishing lure. 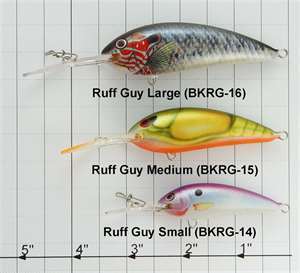 Jigs are considered one of the top Big Bass fishing lures, if not the top. A jig has always been considered a cold water lure. In reality a jig can be effective any time of the year. Any serious angler should carry two or three jigs in your tackle box if you are fishing different depths and structure. 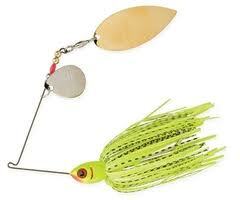 A Jig consist of a weighted head, hook, skirt, weed guard, and maybe a trailer and rattles. The head may have the shape of a football, a bullet or a ball. The skirt may be made of silicone, rubber or hair. You can change the shape, size and color of the jig by changing the skirt. Weed guards prevent hang ups in vegetation or structure. Weed guards on a jig may also prevent a good hook set. So it is best to trim the weed guard back to make it more limber. No jig is complete without a pork or plastic trailer. The trailer contributes to the color and shape of the jig. It also affects the speed of the drop. Jigs can be fished in shallow or deep water. Jigs will not produce bass in numbers but they will produce more big bass than any other bass fishing lures in the opinion of many anglers. There is nothing quite like the thrill of a big bass blasting a topwater lure! 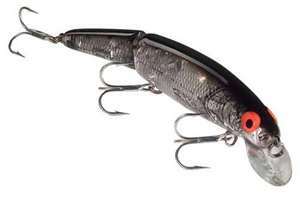 There is a wide variety of styles in the topwater category. Each style is designed for certain situations. Get some of these lures in your tackle box. Buzzbaits are similar to spinnerbaits. They are big and noisy. Fish this lure in shallow water around structure and shorelines with heavy action rods and heavy line. Floating minnows such as a Rapala are very effective in clear shallow water. Use this bass fishing lure early in the morning and late afternoon when the surface water is calm. I like the jointed minnow myself because it has more wiggle when retrieving. When casting this lure, make the least amount of splash as possible. Then let the lure sit still while the ripples fade away. Then give it a slight twitch, and hang on! A popper or chugger is a bass fishing lure with a scooped out face. It might have a few funny looking feathers attached to the end treble hook. After casting, jerk the lure then let be calm, then jerk again and let it be calm. Jerking the lure causes a popping noise. The popping noise drives the bass crazy. The bass bites the lure. You catch the bass. I like that! A prop bait, such as a Devil’s Horse or Tiny Torpedo, has propellers on both ends or one end. By using a fast retrieve the props create a churning action in the water. I remember as a small boy my father had a Devil’s Horse. It was red and had a lot of sharp hooks on it. I picked it up one time and it felt like the hooks just wrapped around my fingers and held on! I hated that thing but it caught plenty of bass. Scum Baits, such as a Frog or Rat, imitate a frog and a rat. Hmmmm...interesting! This type bait is very effective early in the morning or late in the afternoon on hot summer days. Actually any day of the year will work. Flip one of these lures into vegetation or on top of lilly pads and drag it through. Allow the lure to drop off in the middle of the vegetation...and hang on. Use a heavy action rod and a thick line to pull the lunker bass out. Plastic Worms are the most popular, least expensive and most versatile bass fishing lure. There are multiple ways to fish a plastic worm. There are also many types of plastic worms. Straight worm 4-6 inches long. Used with Carolina rig, Texas rig, drop shot and any other way you can imagine. Ribbed worms cause vibrations in the water. Makes bass crazy you know. Curled tail worms give out a slight vibration. Ribbon tail worms flail about wildly so they have a visual attraction. Flipping worms are thicker to hold the hook better when flipping and pitching. Plastic worms are easy to skip under overhanging limbs and docks. Here is a situation. All else has failed. You have tried every ugly high priced bass fishing lure in your 4 tray tackle box and...nothing, not a bite or a nibble. Rig up a 6-10 inch worm, sling it out in open water or around structure and see what happens. Oh I forgot to mention, plastic worms come in every color imaginable and they are the NO.1 bass fishing lure!